The Widget Builder can be accessed by navigating to Content > Widgets > Public Widget Builder or by default it is publicly linked in the homepage’s Share Events box. Number of Results: You can enter any number up to 50. Days Ahead: You can enter any number up to 365. Groups/Departments: The builder allows you to select one group. If you’d like to pull multiple groups’ or departments’ events you can tack on more groups or departments to the URL (&groups=group_a&groups=group_b OR &departments=department_a&departments=department_b). It’s just not currently baked into the actual builder. Keywords and Tags: Enter all applicable words. Only Show Featured: When checked, only events flagged as a featured event will be included. Only Show Sponsored: When checked, only events flagged as a sponsored will be included. Include All Matching Instances: If checked, the Widget will display all recurring instances. If not checked, the Widget will only display the first instance in the recurring chain. Places: Select all that apply. Excluded Content: Any Filters specified in these drop downs will not be included in the Widget. This is helpful in an “all, but one” situation. Widget Type: You have the option of a List Widget or a Mini Cal + List Widget. The List + Mini Cal Widget provides a drop down of all available Event Type Filters to narrow down what events the list displays. The mini cal and “today’s events”/”this week’s events” will change the list results accordingly. The mini calendar extends 12 months. Hide Descriptions: Event descriptions will not be shown. Truncate Descriptions: Description, location, and event image will be hidden upon page load, however, when an event is clicked this information will appear. Render HTML in Descriptions: This allows any HTML entered in admin (bold, etc.) to be displayed automatically. Hide Event Images: Photos will be completely hidden. Hide Event Times: Times will be completely hidden. Hide ‘View All Events’ Link: The view all events link will be completely hidden. Open Links in New Window: If an event is selected, another window will open. After you have made all necessary specifications, you will see two options to generate your Widget results. Preview Widget: This will open your Widget results in another tab. On this page you can confirm that the correct events are showing and that the output options are working as expected. Generate Embed Code: This will display the embed code for your Widget to be included on your website. Localist allows you to create Widgets with custom code that changes the overall look, feel, and behavior of Localist’s standard Widgets. You can use this tool to build Widgets that match the aesthetic of your homepage, a sub-page, or a separate website. Display Name: This is what will be displayed in the public facing Widget builder’s style drop down. Internal Name: This will be automatically filled in. For example, if you enter “Pinterest Board” for the Display Name then the Internal Name will be pinterest-board. This is displayed in the URL the widget builder generates when using a custom theme. In Content > Widgets you’ll automatically see your Widget theme templates. Places List: This displays a list of Place profiles with name, image and description in the List (Classic) style. Generating a preview: Visit yourcustomdomain.com/widget/places?format=html. Logged-In User Plans: This displays a list of events that a user has selected “I’m Interested” on. User must be currently logged in. 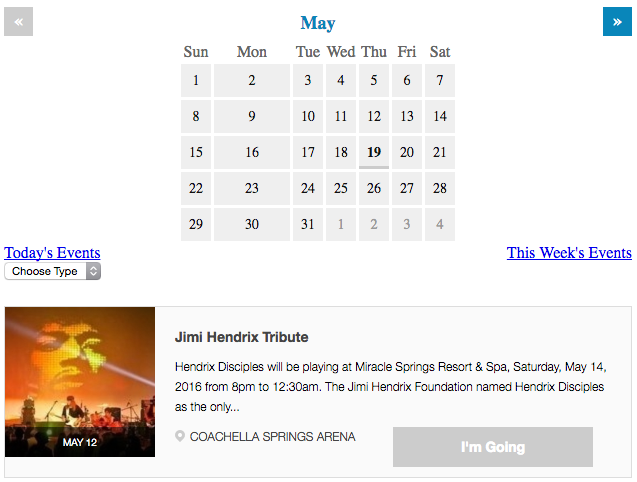 Generating a preview: Visit yourcustomdomain.com/widget/plans?format=html. Badge: This creates a See More Events button that can be added to any webpage or as a compliment to a widget event list. Generating a preview: Visit yourcustomdomain.com/widget/badge?format=html. _platform_styles: This file affects the List (Classic), Logged-In User Plans and Place List widgets. These are additional parameters that can be used for the Widget, in addition to those available on the Widget builder. Each parameter should be passed in as standard parameter in the Widget URL. Two forms cannot be mixed. Boolean parameters are true for values of 1, y, yes, true. In many cases, the presence of the parameter is all that is required. When in doubt, don’t include false parameters. Not set (default): matches events that have at least one of the listed Tags/Filters. All: matches events that have all listed Tags/Filters. Are you looking to integrate Localist content into another system’s internal interface? If yes, then you will need to use the API. Do you have the technical expertise or resources to build and implement a tool that displays JSON data on a web page? If no, then you will need to use a Widget. Outside of these two scenarios, the choice between the API and widget depends on your preferences. That said, we recommend always using the widget builder if you are only looking to display content on other pages as it’s quicker and generates styled data.